The Sloan rug collection has a modern, geometric design and its two-tone colours make it a stylish and contemporary addition to any home. 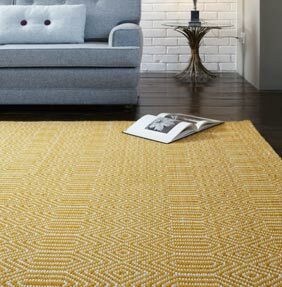 All of the rugs in this collection are available in a detailed tribal, zig-zag design created using a blend of wool and cotton giving these rugs a robust and firm feel, as well as being long-lasting and durable. The perfect choice for high-traffic areas within your home, such as your living room or hallway. Available in a range of colours and sizes, the Sloan rug collection will have something to suit every home. The rich duck egg blue and the calming brown and taupe, combined with the crisp white tones within the rugs allow them to fit effortlessly with many accent colours within your home, creating a chic and stylish décor and enhancing any space.